*This unit must be used in conjunction with an active non-HA Firebox M470 appliance. Firebox® M470, M570 & M670 firewalls are specifically engineered for midsize and distributed enterprises that are struggling to effectively and affordably secure networks in the face of explosive growth in bandwidth rates, encrypted traffic, video use, and connection speeds. What’s more, the ability to add network modules for greater port density gives you the flexibility to adapt as the network grows and evolves. Every network needs a full arsenal of scanning engines to protect against spyware, viruses, malicious apps, data leakage, botnets and more. WatchGuard’s award-winning network security platform not only provides the most complete suite of unified security controls on the market today, but we have consistently been the first to offer solutions for addressing new and evolving network threats including ransomware and advanced malware. communications between the head office and all remote employee and small business sites. WatchGuard Dimension, which is included at no additional cost, provides a suite of big data visibility and reporting tools that instantly identify and distill key network security threats, issues and trends, accelerating the ability to set meaningful security policies across the entire network. Up to 34 Gbps firewall throughput. Turn on all security scanning engines and still see up to an amazing 5.4 Gbps throughput. 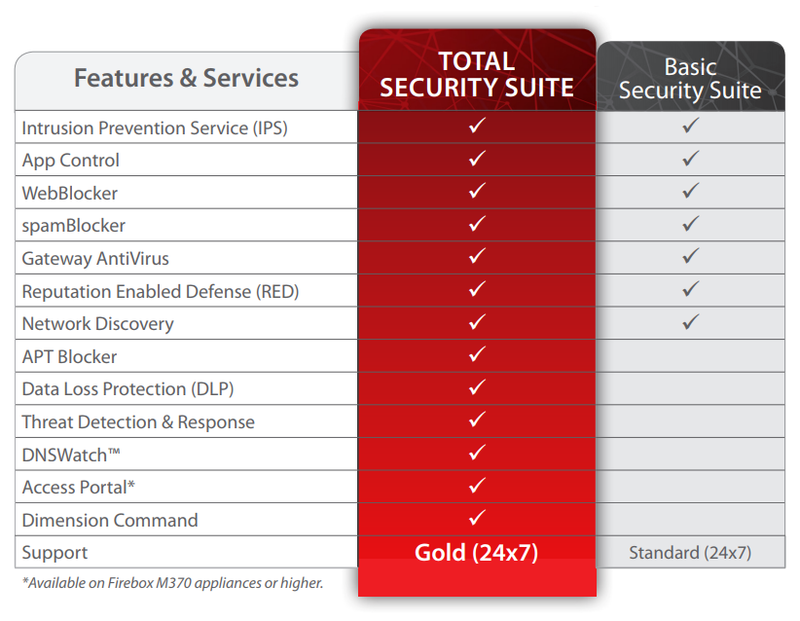 The M270 and M370 are part of WatchGuard’s award-winning Firebox security platform. The platform not only provides the most complete suite of unified security controls on the market today, it has consistently been the first to offer solutions for addressing new and evolving network threats including advanced malware and ransomware. Our unique product architecture enables small and midsize businesses to leverage best-in-class security services - from URL filtering and intrusion prevention to application control and ransomware prevention, minus the cost and complexity of multiple single-point solutions. Interactive, real-time monitoring and reporting through WatchGuard Dimension - included at no additional charge - give an unprecedented view into network security activity so you can take immediate preventive or corrective actions. Over 100 reports and dashboards come standard, including reports for PCI and HIPAA compliance, which means you have one-click access to the data you need to ensure compliance requirements are met. SMBs usually have smaller, less technical staff, which can make network expansion challenging. With RapidDeploy - a powerful, cloud-based deployment and configuration tool that comes standard with WatchGuard Firebox appliances, all you have to do is power up the appliance at a remote site and connect it to the Internet. The appliance “phones home” and downloads the correct configuration files from the cloud. Just like that. It’s in WatchGuard’s DNA to deliver advanced network security technologies that were previously thought to be too complex for small and midsize organizations. We take these enterprise-grade technologies and make them easy to manage and deploy. The end result? Small to midsize businesses have one solution, delivering enterprise-grade security, that can be managed from a single-pane-of glass centralized console. Latest generation Freescale multi-core processors provide the power to run all security scanning engines in parallel without causing performance bottlenecks. Up to 8 Gbps firewall throughput. Turn on optional security services and still see up to 820 Mbps throughput. Download the WatchGuard Firebox M470, M570 & M670 Datasheet (PDF).